A device installed at the top of the casing when cementing cement. In the joint operation of several cement trucks, the rubber plugs for cement injection are pre-positioned in the Cementing Head, with upper and lower plugs. Before pouring the cement slurry, put the lower plug into a predetermined amount of cement slurry, then put it on the plug, then replace it with mud or water to make the upper plug down. When the lower plug is blocked by the support ring, the partition in the center hole is The smash is broken until the cement slurry is completely squeezed out of the casing. 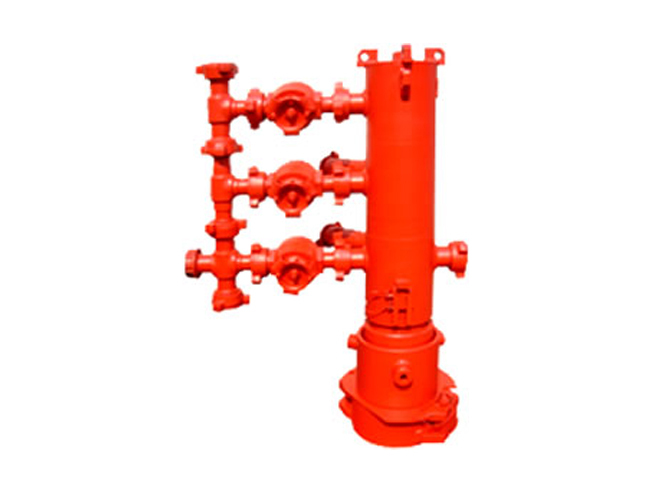 When the upper and lower plugs collide, the passage of the liquid is blocked, the pump pressure suddenly increases, and the cementing operation ends. After the cementing is completed, the cement head is closed to the outside gate, and the connecting pipeline is removed. Waiting for 12 hours, and then testing the return height through the logging, and testing the pressure for 48 hours after the condensation, check the cementing quality. We are Cementing Head Manufacturer. If you have any questions you would like to know, please contact us and we will recommend the products that suit you according to your scope. Previous: What Is The Cementing Process?